Just about a year ago i purchased two WordFence Security Premium Keys. WordFence is a decent WordPress Security Plugin that has a few extra perks if you purchase a premium key. I had no plans on renewing my keys. Just figured id let them expire. Well what a shock i got when i received an email from [email protected] telling me they Auto Renewed my keys. Below is that email. 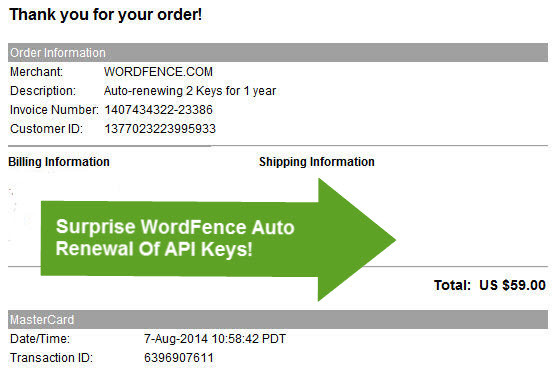 We have renewed 2 of your Wordfence API keys which expire within 14 days. Key belonging to “www.xxxxxxxxx.com” which expires August 20, 2014 and starts with “204174..” was renewed. Key belonging to “www.xxxxxxxxxxxx.com” which expires August 20, 2014 and starts with “73d7c5..” was renewed. I promptly filed a refund request support ticket. While i was logged into their website i decided to turn any auto renewal features off. Unfortunately there are none that i can find. Even under my credit card info page, the only option is to add a new credit card. There was no toggle to turn off the auto renewal of any keys you might have purchased, at that time. This is just a quick FYI post for anyone else that might find having their WordFence keys auto-renewed an unpleasant situation. I’m living on a fixed disability income, and that @59.00 charge to my debit MasterCard is going to cause my car insurance payment to bounce. Hopefully WordFence does the right thing and promptly issues a refund. If not there is always a credit card chargeback. Get too many of these and a seller can lose his merchant account, or the processing fees go up. Oh well.. As usual, just my two cents worth! I had a similar thought, but I did get an email warning from Wordfence that my license was going to end and was under auto renew. You need to login to http://www.wordfence.com and go to the Manage API Keys page (https://www.wordfence.com/manage-wordfence-api-keys/). Then, click the checkbox next to you license and you will see the above menu tab go from “Enable Auto Renew” to “Disable Auto Renew” and with your license checked, click on the “Disable Auto…” tab/button and it will disable the auto renew for the premium license. No doubt WordFence is a good product that works well. However using a Free CloudFlare Firewall will stop attackers before they get to your domain. They also provide excellent FREE caching to accelerate page loads, and Free https to encrypt your website.